Popular with new gym members and for people exercising at home, the enduring attraction of the Versaclimber Club is its versatility. Capable of delivering a lighter but challenging workout, thanks to a lower step height, the Club can be as easy or demanding as the user wants. Designed and developed with feedback from enthusiasts, the Club model provides an easier workout by offering a step height from 1-10 inches, as opposed to the 1-20 inches available with alternative models in the Versaclimber range. 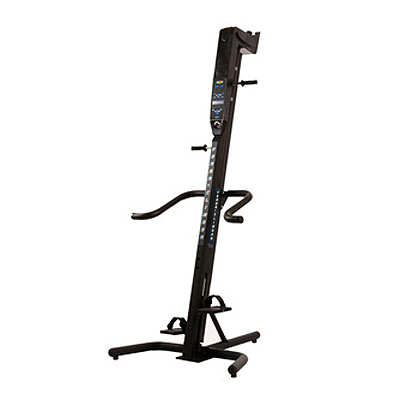 Novice and intermediate users find the Versaclimber Club ideal for a starter-session or intense workouts. As well as helping to quickly burn calories and build strength, sessions can be tailored to reach individual fitness goals. Research shows VersaClimbing for 20 minutes or less, actively engages and tones all the major muscle groups and is more effective and time efficient than treadmills, ellipticals, steppers and bikes. The Versaclimber Club offers a wide range of cardio and strength work. Whether you prefer long muscle toning leg strides, explosive sprints or a range of movement somewhere in between, the Club can be tailored to suit you.